Bidang, Iban people. 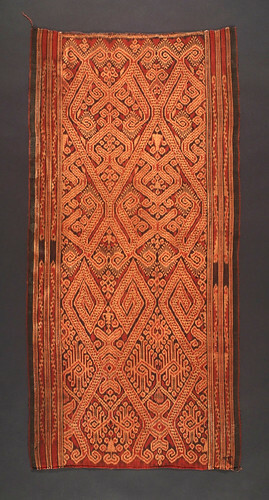 Sarawak 20th century, 50 x 101 cm. Lintah motif. From the Teo Family collection, Kuching. Photograph by D Dunlop. Momentum is conserved. So all particles that have momentum can cause changes in the momentum of another particle if they are absorbed or emitted. Then X, the particle that is absorbed or emitted, is often called a force-carrying particle. Force-carrying particles that are material or charged are usually easy to detect in the immediate vicinity of an interaction. So the forces they impart are called contact forces. Phenomena like automobile collisions and gunshot wounds can be analysed using contact forces. X is much less conspicuous if it is ethereal and neutral. Such particles can be difficult to detect, and the forces that they carry may seem to come from far away. So they are often referred to as exchange particles to suggest a remote origin, and their effects are called action-at-a-distance forces. If X is imaginary then its force may seem to come from nowhere. Some of these force-carrying particles are difficult to characterize and distinguish as individuals, so it is often more convenient to group lots of them together and refer to them collectively as force fields. Isaac Newton, Mathematical Principles of Natural Philosophy. Translated by I. Bernard Cohen and Anne Whitman. University of California Press 1999, page 416.